1. Use Your Credit Card Only on Secure Web Sites. Look for clues, such as a closed padlock, an unbroken key symbol or the "s" in the url--https://. Read the Web site's privacy and security policies to learn how it protects your information, and look for online merchants who are members of such programs as TRUSTe, Verisign or BBBonline, which set voluntary guidelines for privacy-related practices. 2. Shop with Your Credit Card on Your Computer at Home. Don't shop online from public Wi-Fi connections, and don't use a public computer, such as those provided in hotel lobbies, or your smart phone to check accounts or shop. Your information is vulnerable when using any of these. 3. Use Your Credit Card--Not Your Debit Card. The liability protection on credit cards is much stronger under federal law than on debit cards in cases where hackers steal your information. With a credit card, you're liable for only $50 of unauthorized purchases per card, even before you report the fraud. With debit cards, you have to report the fraud within two days to have that same $50 protection, and your liability can go up to $500 if you report the fraud after two days and within the next 60 days. After that, your liability is unlimited. 4. 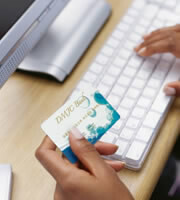 Give Your Credit Card Number Only to Trustworthy Online Merchants. Shop with established, well-known merchants to be safe. If you want to buy from an obscure company, do some research to make sure it's legitimate. Read about the company on other Web sites, make sure it has a working phone number, get the outfit's physical address, and check with the Better Business Bureau in the merchant's local area. 5. Review Your Credit Card Statements. Make sure there are no unauthorized charges, and report any problems immediately. Also, check your credit reports annually to make sure no credit card accounts have been opened in your name without your permission. 6. Use a Virtual Credit Card. Some credit card companies offer single-use credit card numbers for customers to use when shopping online, so hackers can't steal the regular account numbers. See if your credit card company offers this option. 0 Responses to "Safe Credit Card Use on the Web: Six Tips for Shopping Online"